Public-private partnerships claim to have saved millions of lives since 20001, but despite their efforts, the Millennium Development Goals on health were not reached. It remains questionable if the achieved results can be sustained without well-functioning health systems2. The World Health Organization (WHO) states that failing health systems are the root cause for low health outcomes and inequalities3. It hampers the right to health, as a rights-based approach to health requires accessible, affordable and high quality care4. Also with the Sustainable Development Goals in mind, we might have to rethink our current approaches. In this article, I take a close look at the functioning of the Global Vaccine Alliance, known as Gavi. Public-private partnerships such as Gavi have often been criticised for being too disease-focused; Gavi focuses on vaccinating children. These disease-specific approaches contradict with earlier agreements made by the international community like the Alma Ata Declaration for strong primary healthcare and the Paris Agreement on Aid Effectives from 20055. Moreover, the WHO stresses the need for Health System Strengthening (HSS) in its Framework for Action: strengthening health systems to improve health outcomes3. Currently, public-private partnerships, such as Gavi develop programs with the aim to strengthen health systems. However, it is questionable whether those programs positively contribute to health systems in low income countries. HSS programs are criticised as ‘old wine in new bottles’ and when badly executed it could become a meaningless container concept6. Gavi’s primary aim is to provide more equitable vaccination coverage in low-income countries7, but hits a roof where health systems are not functioning. To overcome these ‘system barriers’ or ‘bottlenecks’, Gavi invests in programs labelled as ‘health system strengthening’. However, Gavi’s approach is criticised for not truly strengthening health systems but rather strengthening the power of Global Health Initiatives8. The approach of public-private partnerships has moved the debate around health systems from the political debate to a technical debate8. The doubt about the effects of HSS programs is alarming. Therefore, I compared the approach to HSS suggested by the WHO with the practical investments by Gavi at country level. My aim was to understand how the approaches differ and why. Below I present the main findings from my qualitative study based on programs labelled as HSS by Gavi, literature and expert interviews. What is Health Systems Strengthening? To explain HSS, WHO refers to their building block model for health systems (see figure below). HSS is defined by WHO as: “improving these six health system building blocks and managing their interactions in ways that achieve more equitable and sustained improvements across health services and health outcomes. It requires both technical and political knowledge and action”3. 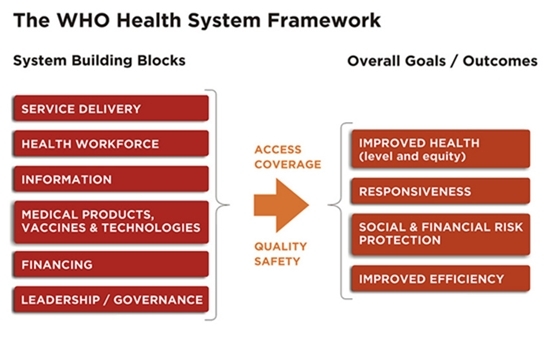 The building block model from WHO should assist everyone who wants to address a health system. In practice, it appears that Gavi maintains a very different interpretation of HSS. The building blocks are used to justify their HSS approach, which is meant to strengthen results in vaccination. HSS is mainly done via investment in local resources: cars, boats, bikes, kits for community health workers and cold chain equipment. Most of their actions are related to service delivery, human resources and information, and usually at local or district level9–11. It appears that the interconnectedness between the building blocks is hardly taken into account. Poorly designed programmes with a disease specific approach still risk unwanted effects and fragmentation of the system12. At the same time positive effects may lag behind, as system barriers remain. Let me give two practical explanations I was given during my interviews. They show how HSS programs can interfere negatively with the health system. Gavi funds a programme labelled as ‘health system strengthening’ in Kenya, with the aim to convince the population to vaccinate its children (demand generation). However, local health systems are sometimes left unable to meet the need for vaccinations while people need to travel sometimes far to reach the clinic. When Gavi has created demand before all vaccinations can be supplied, some patients are left with an unmet need. If the demand for vaccinations increases while in practice it remains challenging to vaccinate children, the trust in the health system could be harmed. Even when immunisation services are improved, but not general care at health clinics such as treating an abscess or diabetes, this could decrease trust in the health system by the population. For example when people visit the clinic for general care, but this need cannot be met. Because of the decrease in trust, people would be less eager to return to the clinic to vaccinate their children. This is not only an issue actually for vaccines. One expert mentioned that women would not return to a local clinic to give birth because when they saw the clinic, they assumed that care at the clinic would be hardly better than at home. Only if health systems meet the needs of the local population, trust in the health system can grow. This is why the concept of the ‘responsiveness’ of a health system is so important and requires good leadership besides financial investment. Why does Gavi still have a disease-specific approach? Based on the HSS programmes by Gavi, literature and interviews, I found the following reasons why the environment which supports the continuing of disease-specific approaches remain. First, indicators play a strong role. They create a drive for short-term success. Gavi aims for “the biggest bangs for the bucks” based on their primary goals. As a consequence, progress in ‘Health System Strengthening’ is measured by vaccination follow up rates and other indicators directly related to vaccination13. This has two disadvantages. Their indicators do not measure the possible adverse effects for the health system like the above mentioned examples show. Moreover, long-term effects on the health system can easily be overlooked. However, it is these lasting effects, whether positive or negative, which are important to understand. The positive long-term effects of actions cannot easily be translated into ‘lives saved’, in a relatively short term period. Second, for Gavi as a Public-Private Partnership the advanced market commitment is stated as their business model14. Their aim is to create a market for vaccines to reach their goal: to provide more equitable vaccination coverage in low-income countries7. This short term commitment to the market resembles a neo-liberal approach and misses out on long-term sustainable solutions which would contribute to a rights based approach. The ambition to build a market for vaccines could be conflicting with the ambition to build a responsive health system. However, the ‘saving lives’ story attracts investment and donations and could undermine investment in alternatives which cannot be easily translated into ‘saved lives’15 such as system investments. Again, this might undermine a shift to a systems approach. Third, there is an imbalance in power between Gavi and the recipient low income countries. Gavi calls its program ‘country driven’ as governments write the proposals. Nonetheless, Gavi has the power to deny proposals due to which countries have to adjust and resubmit the proposals according to Gavi’s criteria. This process is time consuming and burdens the ministries of health. While I only included Gavi’s HSS programme in my research, other research has shown similar results. An example is the study by Cavalli16, who showed comparable effects by an HSS programme focused on neglected tropical diseases. This is probably the case for many global health initiatives. Besides, if all other development organizations demand that health system strengthening programs are in accordance of their own short-term disease-specific goals (like vaccination in Gavi’s case), there is only limited space for countries to truly invest in the long-term needs of the population (e.g. primary healthcare). Therefore, the gravity of the problem should not be underestimated. How about the WHO? Although WHO mentions that one of its objectives is to steer Global Health Initiatives to a less vertical approach, it is in a relatively weak position compared to public-private partnerships, mainly due to its financial situation17. So far WHO appears unable to correct the misuse of the building block model. How to move towards responsive health systems? As long as countries do not have an adequate system to raise funds for their health system (e.g. insurance or taxes) they will remain dependent on big donors such as Gavi. In practice, Gavi hardly focuses on the financing of health systems. Nevertheless, Gavi aspires that countries buy all vaccinations themselves in the future. Here it shows the need for countries to make progress in Universal Health Coverage to become able to fund their own health system, as is a goal for the sustainable development goals. In my research I also questioned issues that were left unproblematic in the HSS discussion. I have seen that a label of ‘health system strengthening’ on a programme surely does not mean that the programme actually strengthens the health system. For now my conclusion is that there is an urgent need for more systems thinking in programmes, financial independency for low income countries, better governance for health and suitable indicators to monitor health system programmes. We should remain critical to programs addressing health systems, in order to ensure that all programmes truly strengthen health systems. In the end of the day, badly functioning health systems imply that people cannot reach, afford or receive the care they need. Gavi. Half a billion children vaccinated and seven million lives saved thanks to Gavi partners. http://www.gavi.org/library/news/press-releases/2015/half-a-billion-children-vaccinated-and-seven-million-lives-saved-thanks-to-gavi-partners/. Accessed March 23, 2017. Ooms G, Van Damme W, Baker BK, Zeitz P, Schrecker T. The “diagonal” approach to Global Fund financing: a cure for the broader malaise of health systems? Global Health. 2008;4(1):6. doi:10.1186/1744-8603-4-6. World Health Organization. Everybody’s business: strengthening health systems to improve health outcomes: WHO’s framework for action. 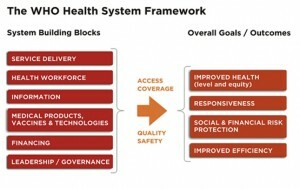 2007:1-56. http://www.who.int/healthsystems/strategy/everybodys_business.pdf. Ooms G, Marten R, Waris A, Hammonds R, Mulumba M, Friedman EA. Great expectations for the World Health Organization: A Framework Convention on Global Health to achieve universal health coverage. Public Health. 2014;128(2):173-178. doi:10.1016/j.puhe.2013.06.006. Hafner T, Shiffman J. The emergence of global attention to health systems strengthening. Health Policy Plan. 2013;28(1):41-50. doi:10.1093/heapol/czs023. 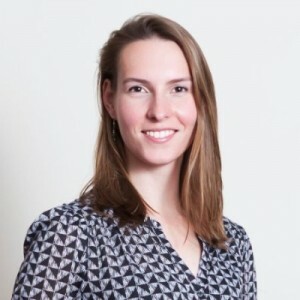 Marchal B, Cavalli A, Kegels G. Global health actors claim to support health system strengthening – Is this reality or rhetoric? PLoS Med. 2009;6(4):1-5. doi:10.1371/journal.pmed.1000059. Gavi. Gavi’s mission – Gavi, the Vaccine Alliance. http://www.gavi.org/about/mission/. Published 2017. Accessed March 15, 2017. Storeng KT. The GAVI Alliance and the “Gates approach” to health system strengthening. Glob Public Health. 2014;9(8):865-879. doi:10.1080/17441692.2014.940362. Republic of Kenya Ministry of Health. Proposal for Health Systems Support. ; 2006. http://www.gavi.org/country/kenya/documents/. The Government of the Republic of Zambia. GAVI Alliance Health Systems Strengthening (HSS) Applications. ; 2007. http://www.gavi.org/country/zambia/documents/. Republic of Uganda. GAVI Alliance Health System Strengthening ( HSS ). ; 2007. http://www.gavi.org/country/uganda/documents. Savigny D de, Adam T. Systems Thinking for Health Systems Strengthening. ; 2009. doi:10.1155/2010/268925. Gavi. Health systems goal indicators. http://www.gavi.org/results/goal-level-indicators/health-systems-goal-indicators/. Published 2017. Accessed March 22, 2017. Gavi. Gavi’s business model – Gavi, the Vaccine Alliance. http://www.gavi.org/about/gavis-business-model/. Published 2017. Accessed March 15, 2017. McCoy D, Jensen N, Kranzer K, Ferrand RA, Korenromp EL. Methodological and Policy Limitations of Quantifying the Saving of Lives: A Case Study of the Global Fund’s Approach. PLoS Med. 2013;10(10). doi:10.1371/journal.pmed.1001522. Cavalli A, Bamba SI, Traore MN, et al. Interactions between global health initiatives and country health systems: The case of a neglected tropical diseases control program in Mali. PLoS Negl Trop Dis. 2010;4(8):1-7. doi:10.1371/journal.pntd.0000798. Kickbusch I, Reddy KS. Global health governance – the next political revolution. Public Health. 2015;129(7):838-842. doi:10.1016/j.puhe.2015.04.014.